This is doubtlessly one of the most hotly anticipated Doom Metal releases of the year. 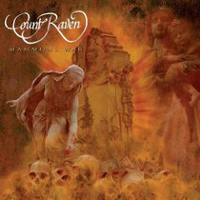 Count Raven was part of the legendary roster of Hellhound Records in the 1990s, and it was only logical that I Hate would become the new home of Dan ‘Fodde’ Fondelius and his new bandmates (bassist Fredrik Jansson, from Witchcraft, and drummer Jens Bock, from Fodde’s previous band Doomsday Government). All the trademark elements of the Count Raven sound are here, from Dan’s vocals incorrigibly sounding like Ozzy’s twin brother to the well-aged sludging riffs. Sure enough the album has a distinct early Black Sabbath sound which doesn’t seem in a hurry to move on. There’s also the customary atmospheric song, 2 in fact - the album’s title-track – which is really an excellent track, the like of which it would be great to hear more of and the closer ‘Increasing Deserts’. Other tracks I particularly appreciated were ‘To Love, Wherever You Are’ – a psychedelic gem simply consisting of vocals and acoustic guitar – and ‘A Lifetime’ because it epitomises what Doom is all about. Lyrically, “Mammon’s War” is also typical of Count Raven, containing a series of social statements inspired by contemporary issues which in this album tend to focus on mankind’s urges of greed, materiality and self-destructiveness. All of this is quite in tune with the emotiveness of the music. To be honest I don’t feel that, overall, “Mammon’s War” is as stunning as the band’s first 2 full-lengths but it’s a great album nonetheless and shouldn’t disappoint those already in possession of the band’s other releases. In fact, adorned with an excellent artwork, “Mammon’s War” comes across as a must for anyone into Doom.